Add the coffee, ice, milk, sugar and 3 tablespoons of dulce de leche to a blender and mix at high speed until the mixture is soft and the ice has broken down. Pour into a glass, add whipped cream and bit of dulce de leche if you like. You can also prepare this coffee with hazelnut chocolate cream; just replace the dul-ce de leche with it. Let's cool down with something that's part of our Latin culture by preparing a delicious and refreshing frozen coffee with dulce de leche. This coffee recipe is very easy to prepare. It takes longer to go to a coffee shop to buy iced coffee than it does to make it at home. It's creamy, sweet and delicious. I definitely recommend it! 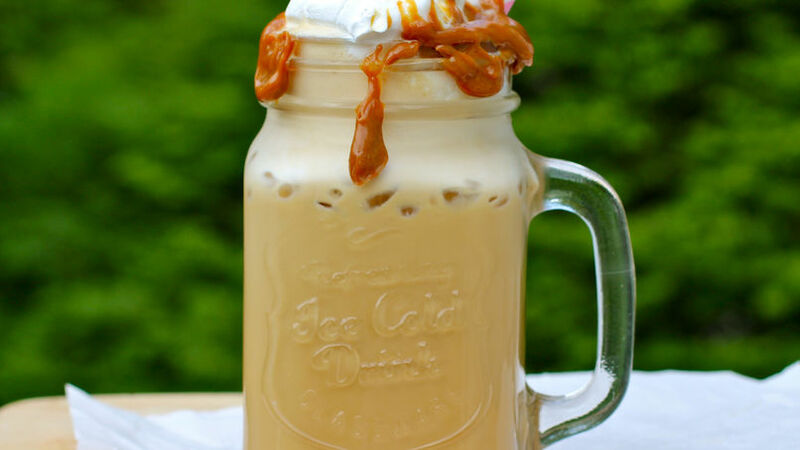 This iced coffee with dulce de leche is one of the most delicious drinks you could treat yourself to and it's perfect for a day in the sun with your friends.